Greetings again from the darkness. “This story is extraordinary – especially if it’s true.” This is just one of many incredulous statements from the film’s narrator, Mickey Rourke. And let’s face it, when trying to establish credibility for a story that’s been in doubt for 30 years, who better to lean on than Mickey Rourke? In defense of filmmaker Jeremy Corbell, there is no proving or disproving the story of Bob Lazar. It’s more like a Ripley’s Believe it or Not entry than a forensic study with conclusive results. One either chooses to believe Mr. Lazar, or not … and there is no way to prove which side is “right”. 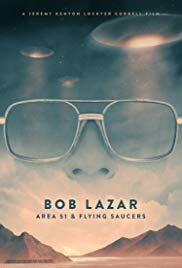 In 1989, Bob Lazar was interviewed anonymously (in shadows with altered voice), claiming that he worked at S-4, a facility adjacent to Area 51, and that his job was to reverse engineer the propulsion system on alien spacecraft – one of 9 being studied. His anonymity didn’t last long, and the one fact in the film that is beyond debate is that his decision to go public with this story altered his life forever. When Mr. Corbell catches up with Mr. Lazar, we find that he doesn’t come across as a crackpot, and we certainly believe that he believes his story. It’s impressive that he’s gone to great lengths over the years to prove his honesty – hypnosis and polygraphs included. With input from investigative reporter George Knapp, we learn of FBI raids and numerous attempts at character assassination. There seem to be no records confirming Lazar’s employment or education (Cal Tech, MIT) claims, though we do have photos of one of the raids. And we learn from his mother than he was always conducting experiments, even as a kid. Another gem from narrator Rourke, “Can we be made whole if we aren’t believed?” might have made for a better focus as a (shorter) documentary. Since his story can’t be proven, perhaps a more personal study of the man could be insightful. We bounce between Nevada, California and Michigan, and director Corbell seems to buy into “The X-Files” claim that ‘the truth is out there’. His choices of the electronic warbles as a score and the ridiculous script for Mr. Rourke to narrate notwithstanding, we do find Corbell and Lazar to be forthright in the presentation, even if their story is never able to “weaponize our curiosity” as initially promised. Proclaiming “reality isn’t what it used to be” doesn’t make it so. One must prove something so, for the doubt to be removed. This entry was posted on Monday, December 17th, 2018 at 8:34 pm and is filed under Documentary. You can follow any responses to this entry through the RSS 2.0 feed. You can leave a response, or trackback from your own site.